Complete rescan of the earlier upload; now bigger & better! The comic was brittle and a few pages are badly chipped around their perimeter. Synopsis: After N'geeso suffers a crocodile bite, Kaänga and Ann go to the country of the Baboon Men for a medicinal moss. 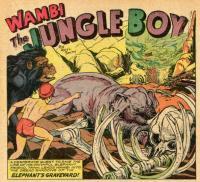 They learn that headhunters have targeted the Baboon Men. Kaänga tricks the headhunters into running into a hot spring where many of them drown. 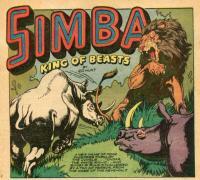 Synopsis: Simba's role as king of the jungle is challenged by a white rhinoceros. Credits: Script: ? [as Ed Hunt] | Pencils: Robert Webb | Inks: E. H. Hart ? ; Jack Kamen ? Synopsis: Melini uses trickery to convince the Mengos that he has magic power. Tabu does a stage trick of his own and exposes Melini. Comic Story (10 pages) Elephant's Graveyard! 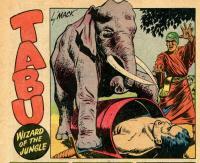 Synopsis: Tawn, wounded by ivory hunters, makes his way to the elephants' graveyard, followed by Wambi and Dr. Burman. Dr. Burman removes the bullet from Tawn and he makes a quick recovery. Synopsis: A convict's wife, devastated by his life sentence, leads a slave revolt against Fantomah. Synopsis: Terry and the gang free a Free French jungle outpost from the Nazis. Synopsis: A con man plans a trip to Africa; on his return he planned to present an actress as the long lost daughter of Steven and Camilla Jordan Dane so that she could "inherit" the Jordan fortune. But the plot runs afoul of Camilla, who remains ignorant of her origins. Credits: Script: ? [as Victor Ibsen] | Pencils: George Tuska; Art Saaf ? | Inks: ? ; Art Saaf ?